“Hear the Buzz” is a sample iPhone app which finds tweets with positive or negative sentiments for certain topics via the IBM Insights for Twitter service in IBM Bluemix. Below is a short description how this service is used from Swift. As a starting point I used the sample app from my colleague Frederic Lavigne. The sample contains a simple Node.js application which provides a REST API that basically just forwards requests to the service and adds credentials so that clients can invoke the API without having to authenticate. I used this mechanism in this simple sample but you might want to change this for production apps. Clients can now invoke REST APIs via insights-search.mybluemix.net/api/1/messages/search?q=bluemix which returns JSON. 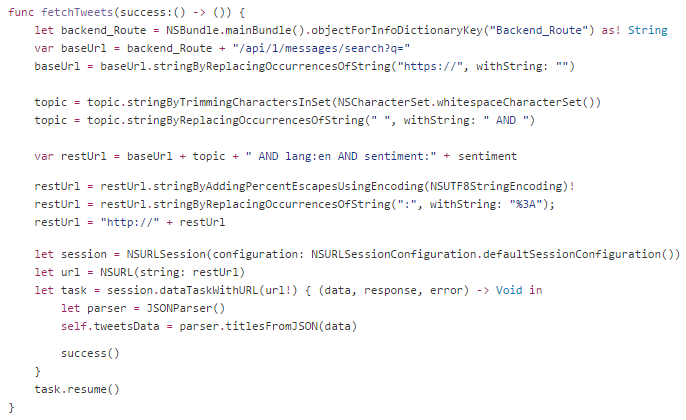 The following code shows how I parse the JSON is Swift. There might be better ways to do this though. I haven’t done much Swift development honestly. 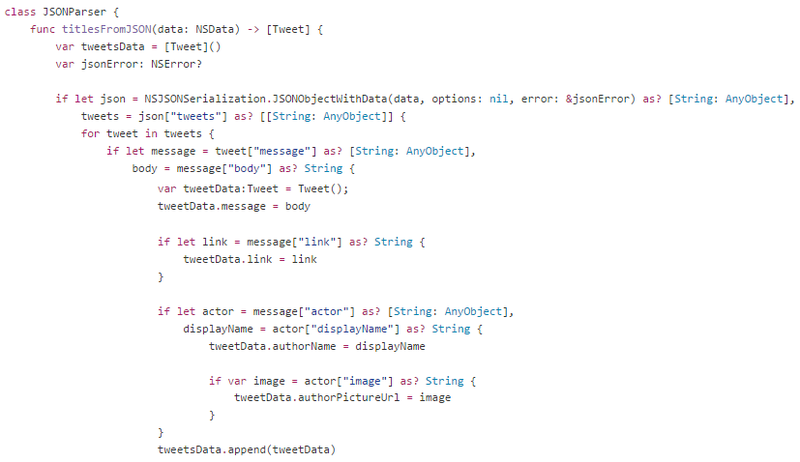 The next screenshot shows the code how to invoke the REST API from Swift. In order to define the tweets I’m interested in I use the query language of the Twitter service.